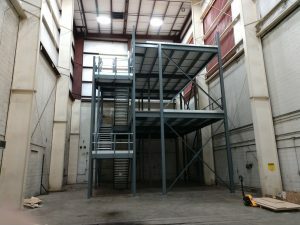 Mezzanines – Canadian Rack Inc.
Canadian Rack mezzanines allow you to change empty overhead space into usable storage areas – depending on the size of your facility, a mezzanine can be one, two or more levels high. These storage structures allow you to leverage potential storage space without having to pay for expensive relocation or reconstruction costs. Mezzanines can be integrated into existing racking systems and are designed with stability and versatility in mind. 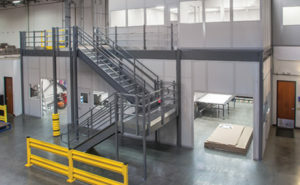 Although a Mezzanine structure can be bolted to an existing building for support, it can also be easily relocated to another facility if your storage requirements change. Further, Mezzanines can be custom designed to suit your particular needs – we never assume that one size fits all. Canadian Rack guarantees we build our Mezzanines according to local building code requirements. We customize design and structure to meet your needs without compromising the safety and stability of the storage solution.